These are simple and effective water filters that install in a jiffy (or less) and last a lifetime. 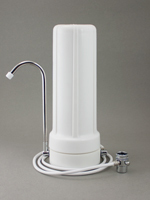 A good countertop filter can be your main source of drinking water, a portable filter for travel, or a convenient source of high quality water in the remote areas of your home. Our best-selling Model 77 uses the highest quality parts available, with several options for housing and cartridges. 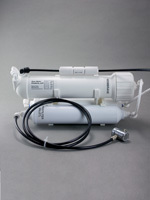 This is the filter of choice for anyone seeking a solid, long-lasting carbon filter to eliminate chlorine and other chemicals from the tap. 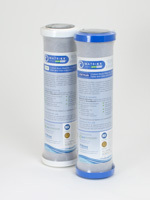 These units provide twice the filtration capacity and a plenty of variety in filtration possibilites. 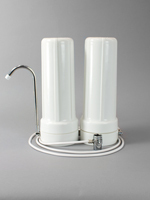 Double countertop filters are an ideal choice for those seeking to add filter options, like lead and fluoride removal, that go beyond a standard carbon filter. This may be the best buy in water filtration, offering the best in water technology at a fraction of the cost of similar undersink units. These tank-free units are not for everyone, however. They lack the convenience of tank-style undersink units, producing water at a slow, steady trickle. 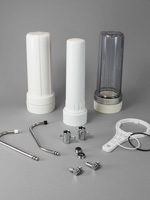 Parts for standard countertop filters (Model 77 and Double 77—see warranty*), including spouts, valves, fittings, o-rings, tubing, adapters, and more. High quality replacement cartridges and membranes for all countertop units. For the Model 77 and Double 77 countertop units, the standard size is 2.5" x 9.75".